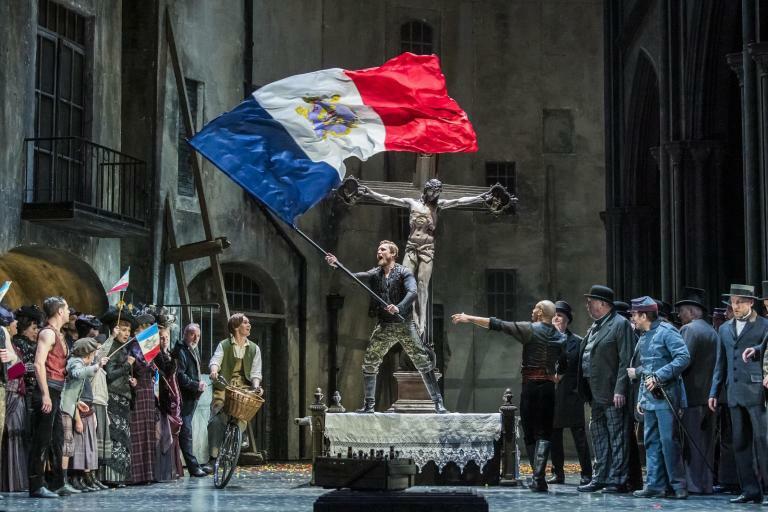 Luc Bondy’s production of Tosca achieved notoriety when it scandalized the conservative Met audience at its premiere late 2009. Unfortunately that’s was the first and last time it got a rise out of an audience. (My S&H review from a 2010 Munich performance here.) If there were only good productions and bad productions, this one would be in the latter category. Last time, Marco Armiliato’s conducting was received with rare boos; this time he was left alone, although it wasn’t that different this time ‘round: He took good care of the score and singers and not much else beyond that. A correct reading, unexciting reading that won’t leave a lasting impression. When I saw this production here two years ago, Marco Armiliato was in charge of musical direction. On that occasion Armiliato was received with boos, something that has not happened now, but I cannot say that his conducting had been particularly bright. He took good care of the score and singers and not much else: A correct reading; one of those that don’t leave a lasting memory. Catherine Naglestad’s Tosca was good, but not quite outstanding. Obviously I prefer her as Brünnhilde in Siegfried a few days ago (S&H review here). Her voice is well suited to the character and she has enough temperament to give credibility to the role. Her high notes sometimes bordered a cry and her diction wasn’t satisfactory; the text in many cases unintelligible. Her most awaited moment, Vissi d’Arte, was good without being particularly emotive. Massimo Giordano as is the typical opera singer of our time: he cuts a movie-star figure on stage and he’s got an attractive timbre… and beyond that there’s little of interest. His voice is too light for Cavaradossi, with a poor middle range which improves at the top, but always sounds rather pushed. There was the same amount of emotion in his singing than the piano-pianissimo sounds he delivered—none. The best part of the cast was Bryn Terfel’s Scarpia, probably the Scarpia around today. His voice has lost some volume compared to a few years ago, but the artist is still present and his second act was great. What a shame that he had to leave a knife on the table that allowed Tosca to force his early exit. Christoph Stephinger a poor Sacristan.